#WIWT Link-Up & a Giveaway! Two AMAZING things are happening on Twenties Girl Style today! 1. 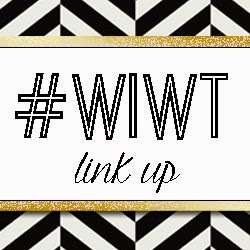 The very first #WIWT link up! Read through the end of the post to find out more! These pictures were taken when it felt like a mild 150 degrees outside. One of those days when you step outside and you literally feel your hair droop and your makeup slide off of your face. But this location was totally worth it! I tagged along to help my sister with a photo shoot, and then we stopped by the local market for some gelato and moseyed along the park path. I knew I had to snap some pictures when we discovered a sweet pond, surrounded by tall trees. It definitely felt like something out of Princess and The Frog…down by the Bayou. This dress by 1802 was the perfect dress for the sweltering heat! It was breezy and light weight and I am absolutely obsessed with the print! I definitely can’t wait to pair it with a chunky scarf and jacket come the fall! I accessorized with some pretty pieces from Chloe + Isabel. Vanessa, my wonderful Chloe + Isabel stylist, has done it again! She seriously knows exactly what will look good on me! This gold feather hinge bracelet looks absolutely stunning all by itself or in a stack and the matching earrings are the perfect compliment! I definitely recommend checking out Vanessa’s Chloe + Isabel shop and contacting her if you need some style advice! I’m teaming up with some amazing bloggers and 1802 for a fabulous giveaway! One winner will receive a $100 gift card to shop1802.com! As always, entering is easy peasy! Just follow the Rafflecopter below… good luck! Now on to the link-up! I’m teaming up with one of my all time favorite ladies, Jalynn of The Red Closet Diary to bring you the What I’m Wearing Thursday, or #WIWT link-up! Next Post Keep it Simple & a Giveaway!! So fun! I love the dress you are wearing – it doesn't look like you were 150 degrees in the photos so they came out great! I just tried again from a different computer and I think it's displaying the HTML code that you out into blogger but it's not displaying the Rafflecopter form just the code. wow, ash, these pictures are stunning! not only are you a bronzed babe, but that dress is so special i love the print and flow and then the location is like something out of the notebook!! Love the dress! And I always seem to pick the HOTTEST day to take outfit pictures where I styled it with a jacket or extra layers haha. Fall cannot come soon enough. I love this dress, the print is so pretty! !